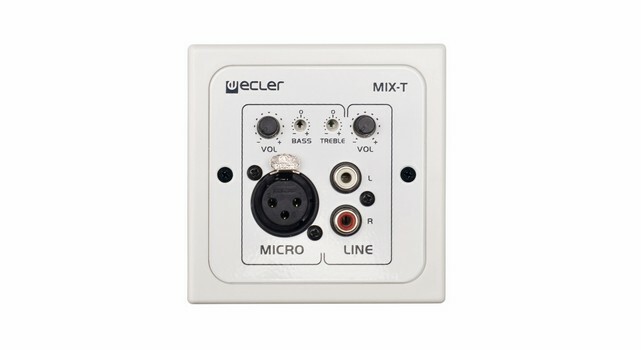 ECLER WPmMIX-T is a 2 channel micro-mixer which keeps the standard wall-panel format of the WPm series. It allows to a mix a stereo unbalanced signal (2 x RCA) with a microphone signal (XLR), getting a balanced mono output that can be sent to a preamplifier, amplifier, mixer, digital or analogue matrix, etc., thus saving inputs in the receiver device. The MIC input includes a 2 band EQ (BASS, TREBLE) and it can use the talk-over function to override the line signal when the microphone exceeds the talk-over detection threshold.